Offering you a complete choice of products which include assa abloy - swing doors for hotels, automatic glass sliding doors, automatic glass swing doors, automatic swing doors, automatic swing glass doors and glass sliding doors. 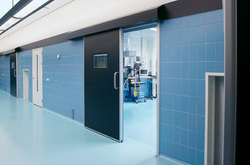 Swing doors take up minimal space while providing maximal opening width. The operators are ideal for both new installations and retrofits, and manual opening is easy if needed for convenience or safety. 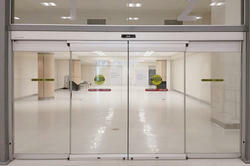 Sliding doors offer single or bi-parting openings, through a variety of styles and configurations. 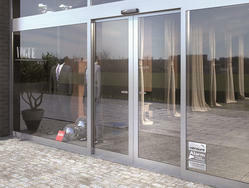 Safe and easy to use, they are suitable for any entrance, from simple opening and closing to providing a hermetic seal. 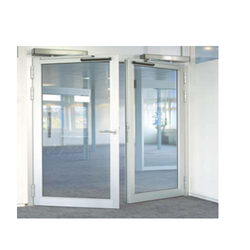 We are one of the leading manufacturer and supplier of Automatic swing doors.We obligated to meet the quality standards as per the customer demand. 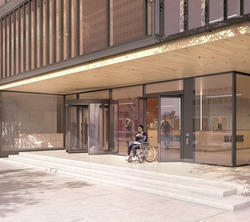 Features main entrance of Malls, Commerial Offices, Hospital, Airports, Hotels etc. 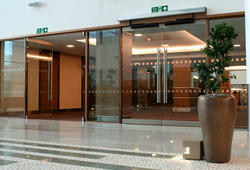 Used In main entrance of Malls, Commerial Offices, Hospital, Airports, Hotels etc. Swing Gates are all about grandeur and class, the very sight of the gate swinging open to greet you when you drive home is very appealing. If you do not have enough lateral room to install Sliding gates, then you can always opt for automated Swing Gates to secure and simplify your entry solution. You can choose from a single leaf or dual leaf design with the maximum length of up to 6mtrs for single leaf or up to 12mtrs for dual leaf. All these Gates open up to a maximum of 90 degrees and this makes Them perfect for high risk security sites like commercial places, commercial and industrial establishment and more. 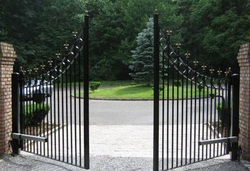 We can also design Swing Gate according to the specification of client or after analyzing the site requirement. Jet India also offers comprehensive services for Site Survey, Installation, Testing, Commissioning, AMC and Servicing. 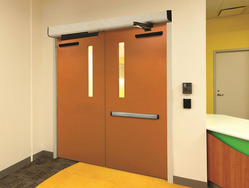 We are one of the leading manufacturer and supplier of Swing Door Systems.We obligated to meet the quality standards as per the customer demand. We are one of the leading manufacturer and supplier of Sensor-based swing doors.We obligated to meet the quality standards as per the customer demand. 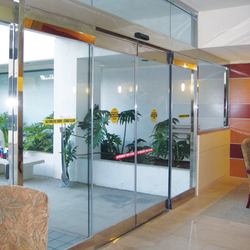 We are one of the leading manufacturer and supplier of Hermetically sealed swing doors.We obligated to meet the quality standards as per the customer demand. Every single sector including residential, Commercial and industrial have been long term fans of the space saving, Linear Movement, tracked sliding gate that are super-efficient and reliable security system that are also fully automated with Non-Encroaching design. They Yield Additional Benefits of being versatile as single leaf or telescopic dual leaf. At Jet India we hold the expertise in using only the best grade of basic component of the system. All Tracks, Brackets, Guides, Rollers, Wheels, Bearings etc. are of the highest quality standards that are capable of standing test of times. We have a wide range of Gates and Sliding gate operator ranging from single user 300kgs to 8000kgs for Industrial purposes. We can also design tracked Sliding gate according to the specification of client or after analyzing the site requirement. 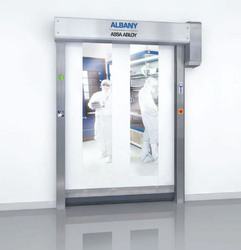 The work covered by this section comprises furnishing all lab our, equipment, appliance and materials and performing all operations in connection with sectional over head doors. REQUIREMENTS OF REGULATORY AGENCIES - All work shall be in accordance with the requirements of the authorities having jurisdiction and all applicable codes, rules and regulations, and ordinances. Features - The door shall be designed in such a way that it doesn’t consist of any protruding parts affecting personal safety in site. 2. Polyester 203 or shop painted in synthetic paint 200um in gloss 60+/.2 RAL 1016(DIN 67530). Certified according to ISO 5 and GMP class C.
Self-supporting side frames made of stainless steel V2A - Self-supporting side frames max. DW 110 mm, motor and top roll cover with max. Lintel requirement of 410 mm, bottom profile. Door curtain - Made of PVC with vertical reinforcement stripes in white (similar RAL 9016). Control system incl. self-opening - Frequency converter control MCC Vector Control with uninterrupted power supply (UPS) for continuous operation in case of power failure. UPS and MCC Vector Control are installed under the top roll cover. | Graphic display and foil keypad for easy operation installed on the drive side. Wind Resistance - The wind resistance is min. 700N/m2 according to norm pr EN 12424 class 3 for a closed door with or without pass door. Water penetration - Resistance to water penetration is 70PA according to norm pr EN12425 Class 3 (exceptional) for a closed door with or without pass door. Air Tightness - At 50 Pa m3 is approx. 8.5m3/m2/h according to norm pr EN 12426. For door weight up to 550 Kg, track shall be 50mm heavy gauge galvanized steel designed for stipulated clearances. Door weight more that 550 kgs, track shall be 76 mm. Provide complete track including brackets, bracing and reinforcements for rigid support of the track for the required door type and sizes .Aligning tracks at proper angle from vertical to ensure light closure at jambs when the door is closed. Wall tracks and roof track shall be 2.0mm thick. Provide galvanized steel track reinforcement and support members. Secure, reinforce, and support tracks as required for size and weight of door to provide strength and rigidity, and to ensure against sag. Sway and detrimental vibration during opening and closing of door. Support and attach tracks at opening jambs with continuous angle in accordance to manufactures specification for size and weight of door. Roof hanger to support horizontal tracks to be hot dip galvanized steel angle bolted to the track for adjustments. We are one of the leading manufacturer and supplier of OT ROOM DOORS.We obligated to meet the quality standards as per the customer demand. 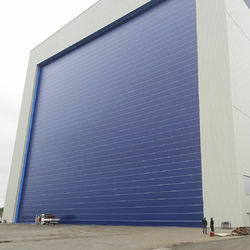 Each sectional overhead door as a complete unit produced by one manufacturer, including electrical motor, sections, brackets, tracks, counterbalance mechanisms, hardware, and installation accessories, to suit openings and headroom available and mixing of different components from different manufacturers is not allowed. The supplier shall have a minimum of 20 years working experience in Qatar for installation and maintenance of sectional overhead doors. The supplier shall have an authorized exclusive agreement with the manufacturer confirming the authorized representation in Middle East and availability of spare parts and factory trained technicians. The manufacturer must have a minimum of 30 years’ experience in the manufacture, installation and maintenance of industrial doors and the installation technicians of service agent in Qatar shall be trained by the manufacturer. The supplier must guarantee in writing ready stock availability of parts and skilled technicians for 10 years. The manufacturer must be ISO 9001 & 14001 certified. 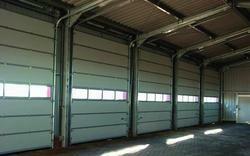 The doors must be manufactured in compliance with European standard E. N. 12445 and comply with CEN standards. 1. 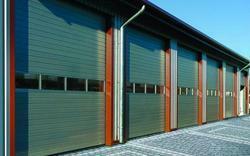 Copies of manufacturer’s specifications and installation instruction for each type of rolling door to show compliance with these specifications. 1. Samples of door sections. 2. Engineer’s review of samples shall be for design only. 3. 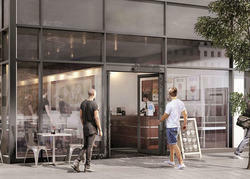 Requirements are the exclusive responsibility of the contractor. Wind Resistance - 90 Km/hrs. 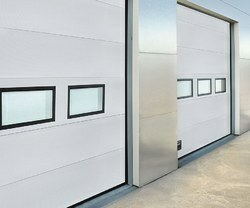 Looking for Doors Automation ?